Whitby. Wintery, wild and windy. Doesn’t sound too promising, but when you’ve got two children under the age of four with cabin fever – and possibly harbouring chicken pox – a two hour drive to the coast seems an attractive prospect. 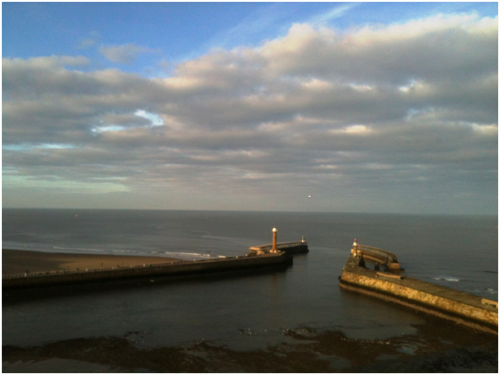 And in fact many would argue that Whitby is at its best in January. Devoid of tourists, the weak winter light and grey skies add to the dramatic atmosphere of the North Sea coast and fossil-rich cliffs, with the headland topped by the gothic architecture of the ruined Abbey and surrounded by the bleakly beautiful moorland of the North York Moors National Park. It wasn’t easy to explain the dissolution of the monasteries to an inquisitive 3-year old, but we did manage to skilfully sidestep the blood-spattered, Dracula-themed shop fronts and – perhaps even more frightening – the money-sucking arcades, before lugging both the toddlers and all their paraphernalia up the 199 steps to the top of the cliffs. The view was worth it. 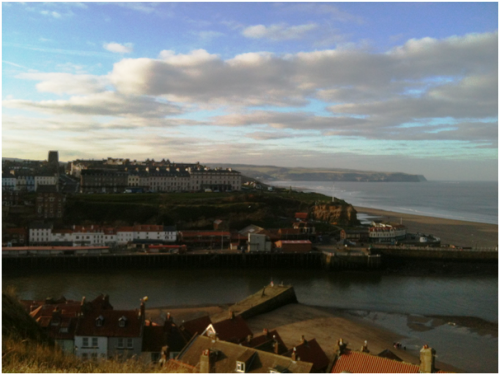 With its working harbour, geological interest, and a fine literary tradition, Whitby manages to retain its charm and fishing-village feel despite its seaside popularity. But of course; the kids didn’t care about all of that. We marvelled at the thousands of lobster-pots, giggled at the family getting mugged by seagulls and did our best to count the fishing boats out at sea. Then there was just time for a quick run around on the beach and the obligatory fish and chips before the long, but mercifully quiet, drive home. When she is not managing the expectations of two lively and inquisitive children, Jasmine Salmon is helping to broaden understanding as a Senior Office in Leeds City Council’s Interpreting and Translation team. 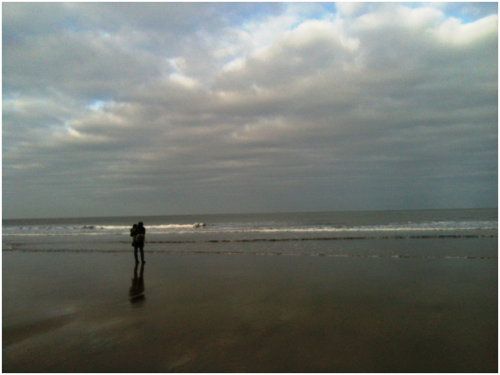 This entry was posted in Diary, Off Season, Places on January 16, 2012 by Paul Scraton.